I have just returned from a brilliant three week trip to Southern Africa, to present at the 34th International conference of the Society for Environmental Geochemistry and Health (SEGH). The conference was held in Livingstone, Zambia on the theme of ‘Geochemistry for Sustainable development'. (See Michael Watt's blog for more information on the conference). 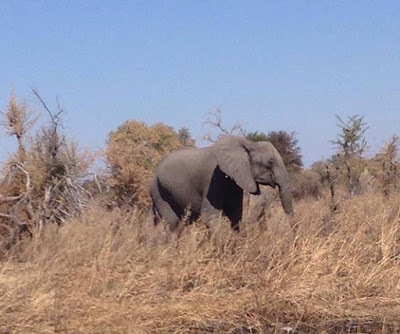 It was followed by a quick trip to South Africa to collect elephant tail hair and faecal samples (see my earlier blog) to be brought back to the UK for preparation and multi-element analysis at BGS. During the conference icebreaker at the Royal Livingstone Hotel, I was invited to give an interview to the Zambian Times, explaining about my PhD research and the application that results from my research may have in the future, to aid in human-elephant conflict resolution. The following day, it was extremely exciting to see the conference featured within their newspaper and on local television. At the conference I presented some initial data from recently conducted fieldwork showing how the phosphorus levels in the soil at the mine site are significantly higher than that sampled in the surrounding areas outside of the mine site. This supports the working hypothesis of the project, that African elephants (Loxodonta Africana) are being drawn towards a mining area just outside the Kruger National Park in South Africa, due to the unique geochemistry of the area. Previous studies have suggested that the soil in areas surrounding the mine, and associated plant samples may be low in minerals such as phosphorus, causing a deficiency in the plants, and driving the elephants to seek these minerals elsewhere. It is therefore thought that the elephants may be drawn towards to the mining area due to the mineral provision in the plants, soil and water. Unfortunately, elephant incursion into the mine and nearby human settlements has resulted in human-elephant conflict, causing risk of injury and loss of income. 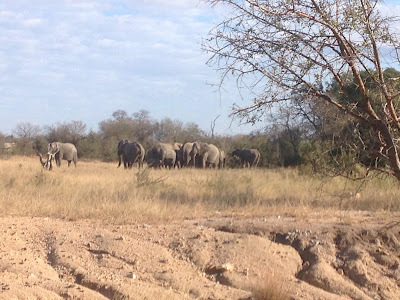 It is hoped that the results of the project may help to inform key locations in the elephants’ home range where mineral-supplemented forage or mineral licks may be placed to reduce the drive to seek additional sources of minerals, thereby reducing human-elephant conflict. Mineral and potentially toxic element (PTE) levels will be compared within and between elephant tail hair, blood, faecal and toenail samples, from elephants at the mine site and elephants within the wider national park. These tail hair samples from fifty animals from across the whole of the Kruger National Park, collected opportunistically over the last 10 years and stored within the SANParks Biobank, will contribute hugely towards calculating the baseline mineral and PTE levels in the species and help identify any key differences to the elephants living around the mine site. I am very excited to start working on analysing these tail hairs and beginning to interpret the data, especially as mineral levels in elephants has not previously been examined in matrices such as tail hair and toenails. Tail hair and toenails are potentially easier to collect and store in the field than blood and could offer a practical solution to assessing mineral status in the animal, both free-living and within captivity. Method validation was made possible for this study by using samples from 20 elephants housed at 5 UK zoos. The zoos kindly donated a multitude of samples from their elephants and the environments in which they live, to enable identification of the optimum matrix for reflecting mineral profile in the species. The zoos in turn will benefit from knowledge exchange and will be able to see how mineral status in captive animals compares to wild counterparts. This may enable identification of any potential mineral deficiencies and enhance captive health and welfare. I would like to thank the SANParks Biobank and South African National Parks Authorities (SANParks) for contributing samples to this work, and for hosting me at their lab in Skukuza to prepare the bio samples for transport to the UK.